If you are following Gabrielle Union on instagram, you will see that she is out here living her best life and enjoying her summer. The actress struck pose for instagram yesterday(August 12th) rocking a chic, casual look. 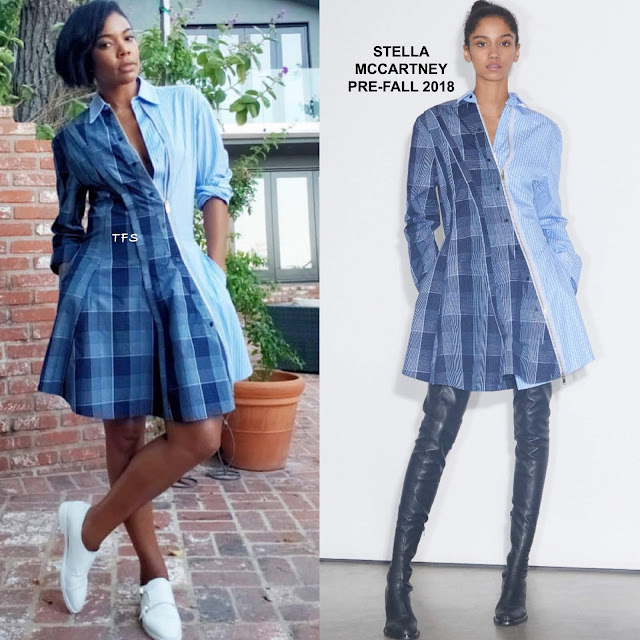 She posed for the gram in a STELLA MCCARTNEY PRE-FALL 2018 blue plaid & blue denim long sleeve shirt dress, featuring an asymmetrical zipper detail, a flare skirt and side pockets which she utilized. While I do like the dress with the boots in the look book, Gabrielle's white STUART WEITZMAN sneakers worked perfectly with the dress. She finished up with a side parted cut and minimal make-up. Are you feeling Gabrielle's instagram style?